Tsukimi, moon-viewing is one of Japanese festivals honoring the autumn moon. The celebration of the full moon typically takes place on the 15th day of the eighth month of the traditional Japanese calendar; the waxing moon is celebrated on the 13th day of the ninth month. These days normally fall in September and October of the modern solar calendar. 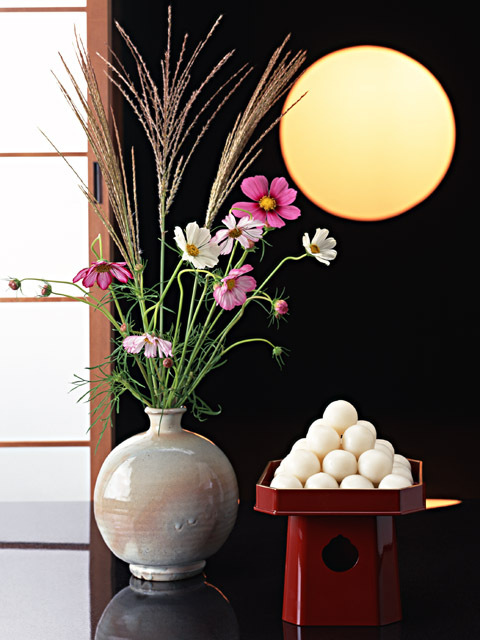 Tsukimi traditions include displaying decorations made from Japanese pampas grass and eating rice dumplings called Tsukimi dango in order to celebrate the beauty of the moon. Seasonal produce are also displayed as offerings to the moon. The moon-viewing custom originally came from China during the Heian period (794 – 1185). During the Edo period (1603 – 1867) the practice of enjoying the beautiful rays of the moon spread to warriors and townspeople. Farmers also incorporated viewing the full autumn moon into agricultural rites. Iowa short summer has ended, we’re entering into fun Holiday seasons, and there are still many more fun occasions to celebrate the rest of year. I hope you and your family to enjoy this beautiful season.